Make family mealtimes fun and healthy with over a hundred recipes from kids cooking expert Annabel Karmel. Annabel Karmel brings you a mouth-watering batch of never before seen recipes featuring delicious ingredients with serious nutritional credentials. With beautiful photographs and fresh design, this is an essential book for every modern parent. Chapters range from Fifteen Minute Meals to Healthy ‘Fast Food’, via Holiday Cooking with Kids and Lunchbox Snacks, and fresh, easy and modern dishes include Quinoa Chicken Fingers, Crispy Baked Cod, The Best Buttermilk Pancakes and Carrot Cake Balls. Real Food Kids Will Love offers everything today’s parents are looking for once their babies are ready to start joining in with family mealtimes. Each dish is designed to be enjoyed by the whole family, while remaining simple, healthy, and not too salty or sugary for young children. 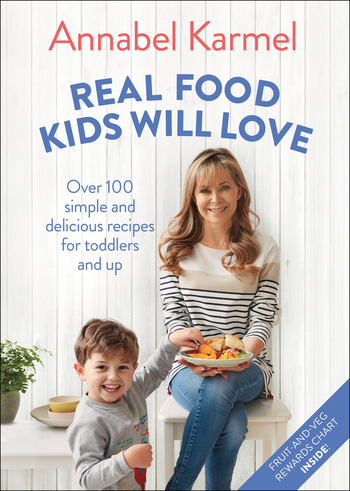 ANNABEL KARMEL is the mother of three children and the UK's leading expert on feeding children. She works with leading US parenting websites such as Parents.com and has appeared on many TV shows, including Today show and The View. She created a popular app, Annabel's Essential Guide to Feeding Your Baby & Toddler, and her website.